We are a leading Wholesale Trader of advanced toolmakers microscope with d.r.o and toolmakers microscope from Pune, India. 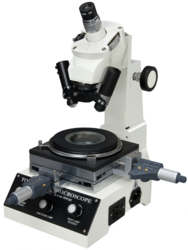 Large Advanced Toolmakers' Microscope base provides extra overall rigidity to the instrument. 300x200mm. size stage assembled on ball bearing guides for accurate smooth strokes. Having fine motion adjustments. 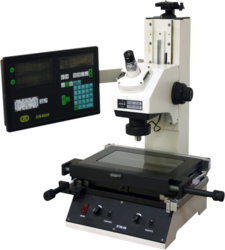 Toolmaker microscopes are satisfies the increasing industrial requirements on measurements. The well designed basic unit with long working distance objectives, wide field eye pieces and a telecentric illumination system have been engineered for long period comfortable operation. It is an ideal instrument for simplifying inspection of forming tools, gauges-template checking, thread inspection verification of tool angles etc. Observation Tube - Monocular, Inclined at 30° Coupled with graduated Eyepiece Protractor. Base - Large and heavy base provides extra overall rigidity to the instrument. Stage - 152mm X 152mm size assembled on ball bearing guides to provide accurate and smooth stage stroke upto 50mm in each direction. Illumination - Sub-stage lamp emits transmitted light from a bottom source equipped with collimated green filter halogen light. Oblique illuminator with adjustable inclination for surface illumination of sample with relief structure, is also provided. Three separate knobs for different illumination are provided with variable light control on the front panel. Looking for Toolmakers Microscope ?